I served this at a dinner party last night and everyone loved it! I had read the "most helpful" reviews to get tips and did the following. Cut Roma tomatoes in half and spoon out seeds. Lay halves down on paper towels to drain while making and mixing the other ingredients. I used measurements as per the recipe and I used really good, 18 year aged, balsamic vinegar (that, I think, was key to making this taste so good!). Next, I chopped tomatoes and mixed everything and refrigerated. I made the toasted slices by brushing olive oil on them, sprinkling each with garlic powder and Italian herbs, then toasted on a cookie sheet under the broiler. I let my guests spoon on the brushetta to the toast so they could take as little or much as they wanted. 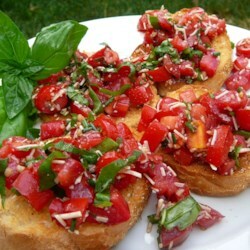 I noticed the mounds of brushetta grow on their toasts after they tasted it! Really great recipe; a keeper!